When my children were small I had more time to devote to craft projects – cross-stitch, sewing little things like Halloween costumes, party dresses for my daughter, and gifts for others. 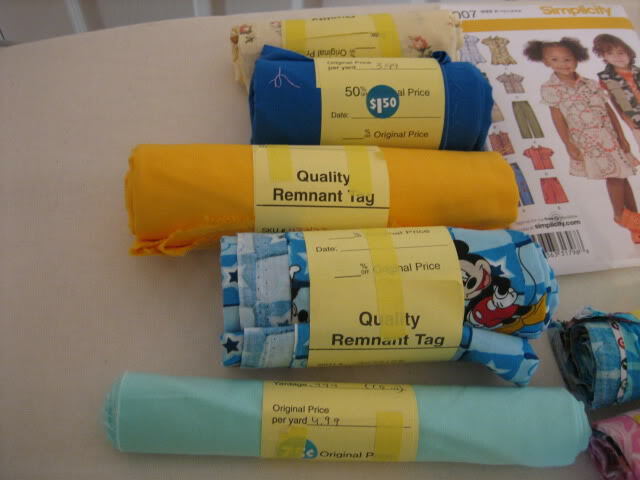 I enjoyed going to the fabric store and digging through the bins of remnant fabrics, little bundles of remaining cloth from a once full bolt that could no longer be sold full price. Most of the time the remnants were tiny pieces of crazy stuff that seemed useless – pieces of neon polyester or gaudy wool plaid. Other times you could find a gem – enough of a wonderfully tiny-patterned piece of cotton that would come in handy, especially if the price was right. Today, I feel like a remnant. The bolts have been taken off the shelf and a few remaining pieces have been chosen to stay, to be bundled in new ways with new labels and tossed into a new bin to await a new life at the hands of a different creator. It’s like the last one standing when all others have fallen or gone away. Not a scrap of fabric that is being stored away for some future purpose like my treasures at home. But certainly a piece that has been left behind to serve a purpose – I’m not sure what yet, but repurposed from the original bolt of fabric that was made of a multitude of threads. This week I have had a brush with – no – was slammed by – an event that has occurred all over our country, including our churches for the past 2 years. Layoffs; the casting aside of employees that a budget can no longer support. I am a remnant of four remaining people of what was once an office of 10 people a month ago. In the bigger picture, I am one of eighteen remaining of what was once close to 40 people three years ago when the economy was booming. The Hebrew Scriptures speak of the “faithful remnant” – those who continue to find favor with God as they follow God’s ways, whether it be in captivity or in the diaspora. Today, even those who are being left behind from a job they gave their loyalty to are part of the faithful. Those who continue on can also feel like the left behind. All are remnants, torn from the fabric of what was once one seamless cloth. And all grieve, for what once was and for the hope that was unfulfilled. The future is uncertain for those seeking a new path and for those remaining behind. I need to resurrect those fabric scraps and cast aside projects. I need to make something new. I think you have captured the thoughts and emotions of many of us who have experienced the loss of our jobs/ministry in the church we were hired to serve in the role of Christian educator. In the Diocese of New Jersey our bishop has said we are in times in which the church has to learn to do things in a different way. Unfortunately that translates into doing ministry with fewer theologically trained professionsals. Thank you for all that you do for us.